My horse is a hard keeper. He is a very picky eater and won't eat his feed. Help! “I have an 8 yr old that is such a hard keeper. I’ve tried everything and nothing works, he is a very picky eater and doesn’t like to eat his feed. I am currently feeding him blue bonnet feed and he is on uguard, someone please help.”-Kaitlyn J. A horse that won’t ‘eat like a horse’ is a concern. When I was in college and a horse showed symptoms of illness such as a fever, or snotty nose one of the strongest indicators of the degree of the illness, and the first question the vet would ask, was ‘is he still eating’? A horse with a lack of appetite has a strong correlation with not feeling well. For this reason horsemen and vets usually look for physical causes first. 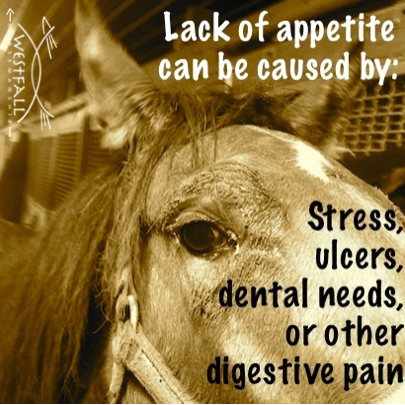 Physical causes can include problems with the horses teeth, ulcers or other digestive pain. Even if the horse has had it teeth floated yearly I would still encourage you to get a second opinion. A friend of mine bought a five year old mare from a professional who assured them the mare was up to date on her dental work. When our equine dentist took a look he found that, yes, work had been done…but the previous ‘dental professional’ had mistakenly left fragments of a wolf tooth during an extraction. As a result the mares mouth had never healed properly. He was able to repair the damage and the mare had a remarkable improvement in her overall attitude. I encourage second opinions. Ulcers and other digestive issues can be a nightmare to detect. This is an area where getting your vet involved is a must. In the past, vets would recommend ‘scoping’ a horse to look for ulcers but many now say that it is possible to have ulcers in areas of the digestive tract where the cameras can’t reach. Because of this I have heard vets recommend treating the horse for ulcers and using the improvement, or lack of improvement, as part of the diagnoses. This is something that you should discuss with your vet because they will have the most accurate and up to date information and can tell you which treatment is right for your horse. Mental stress can also manifest itself with physical symptoms. If a horse has changed living situations, had a buddy die or leave, or anything that they see as stress they may change their eating habits. Try looking at your horses situation through his eyes to find a hidden cause of stress. I have seen horses lower their stress levels after receiving ground work training which then improved their mental health even during general life. I feed a low volume ration balancer because I have also found that some horses don’t want to eat large volumes of concentrate. The one I use is made by Buckeye Nutrition and it is called Gro N Win. I like it because it meets all of the horses vitamin and mineral requirements while feeding a low volume. Depending on my horses weight, age and use I am feeding between one pound to 2.5 pounds of this ration balancer per day. I have looked at other feeds and to receive the same nutrients the same horse would need to eat 8-10 pounds per day. I have had horses that have shown improved interest in grain when there was less of it to consume and I like knowing they are getting everything they need. This last one may seem counter-productive but exercise often improves a horses appetite. Yesterday we took our horses for a long trail ride and last night they ate half-again their normal amount of the free choice hay they have hanging in hay bags. A few months ago when I took Al, the Thoroughbred, from New Vocations for a short time one of the things I observed before leaving their facility was that he had a habit of not finishing his grain. I questioned them and they said that he tended to eat more on the days he was worked. After a few days of adjusting to life with me Al’s appetite steadily increased and leaving grain behind was a thing of the past. He even adjusted to the fat supplement that I gradually added. There are other ways to improve a horses appetite that may be unique to each horse. I once had a horse that would leave grain behind but if turned out in a group to eat they took it as a challenge and finished everything. Other horses find group feeding stressful and will eat less under pressure. With our current travel I have noticed that the horses prefer to eat the new hay…always the new hay. If we are carrying one type and start to switch over to another batch they pick out the new first. It doesn’t matter if the ‘new’ is a 1st cutting or second cutting or if the ‘new’ is a step up or a step down from what they have been eating…the only thing that stays the same is that it is new. This leads me to think that maybe they are enjoying the changes, like trying a new restaurant can be refreshing. When I think about it though I have seen horses in a pasture go around and pick one type of grass…all the clover first, then the timothy so maybe this shouldn’t be a surprise. ← I love the idea of a big open barn or run in for shelter but how do you feed if they chase each other? Stacy I read the grammar link above and I too agree I like the way you write. If we are judged by how we write then I judge you to be an open, honest, caring person who loves to learn from others and share what she has experienced. I love that you keep it real. This is not a doctoral dissertation it is a blog. Have you tried the herb fenugreek? I have heard it helps fussy eaters. My farrier mentioned that they feed a fussy eater black oil sunflower seeds. (Yes the bird seed kind) High in fat for weight gain and the horse loves them. I have noticed my horses like the new as well. It makes me think that evolutionarily, a taste for variety was probably selected for, as that most likely resulted in the most broad range of micronutrients and minerals. Stacy, ignore Rita. We like the way you write. I don’t mind but I am curious…what did I miss? I meant to write about deworming, then I grabbed some food…and forgot! Thanks for adding this. I like feeding the hard keeper yeast as it helps the bacterial flora in the hind gut – in Ireland and parts of the UK they often feed a stout type beer for the hard keeper to encourage them to eat. I have a horse who has been through all veterinary and dentistry tests and checks and now in his 20’s I feed him just about anything he will eat. He prefers grass to hay and in the winter I will soak hay cubes which he seems to enjoy. As he is retired I also soak a senior feed in beer on special occasions and feed him brewer’s yeast day to day.